I’ve been busy today making pies for a school function. I’d planned on making just one pecan pie, but I found this sweet potato pie that looked so good, I decided to make one of each. The sweet potato pie is cooling and may or may not be worth posting, so for now here’s the recipe for Browned Butter Pecan Pie. If you’ve read this blog for any length of time, you know I jump from one pecan pie recipe to another. It’s a bad habit, but it wasn’t always that way. Before I started pie-hopping, I was famous in my town for this one pecan pie. Okay, not really “famous in my town” but a few people said this pie was really good and started rumors that I made good pecan pie all because they tried this one. I’m not sure why I started looking for better recipes. Oh wait, I know why. Because I met a person who made much better pecan pie and have been trying to top hers ever since. Then the other day it dawned on me that her pie wasn’t all that great anyway and I was just really hungry when I tried it. So I’m going back to this pie forever and will never try another pecan pie recipe again. 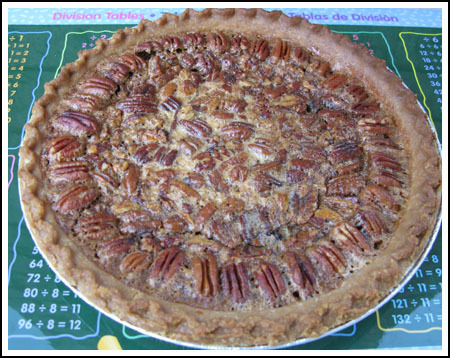 One of our family's favorite pecan pies. Browned butter adds extra flavor. Lay 1 cup of the pecan halves on a cookie sheet and bake at 350 for about 5-8 minutes or until shiny and aromatic. Let cool, then chop so that you have 1 cup chopped toasted pecans and about a half cup of pecan halves (these will be the border). Melt the butter in saucepan set over medium heat and cook it just until it starts to brown. Remove from heat and let it cool for about 10 minutes. Whisk the eggs lightly in a large mixing bowl. Whisk in the sugar, corn syrup, vanilla and salt. Pour in the browned butter. Put the chopped pecans in the unbaked pie shell and pour the filling over the top. Use the remaining pecan halves to make a border. Set pie on a baking sheet and bake at 400 for 10 minutes, then reduce heat to 325 degrees F. and bake for another 35-45 minutes** or until the sides are set but the center (about a 3 inch circle in the middle) is still jiggly. Remove from oven. Pie will set as it cools. Let it cool at room temperature for a few hours. Store in refrigerator until ready to serve. You can keep it at room temperature, but it won't be as stiff. Note: Deep dish pies usually bake 400 for 10 minutes and 325 for 45 minutes while smaller pie tins usually take the original amount of 400 for 10 minutes and 325 for 35 minutes. If it is not there, I think this should be in the top 10! Okay follow up: I LOVED THIS PIE! What a wonderful recipe. I’ve never had pecan pie before this (shock! ), but I know I never want to try another besides this one! Just to clarify, it is white sugar that you’re using, right? Because I know some other recipes similar to this used dark brown or brown sugar. This is the best pecan pie I’ve tasted. My coworkers were surprised that it was so flavorful, not just sweet like most others. Already got one request to bring this to TG. Of course that makes it a more evil pie if you want to eat lots of it….. I always refrigerate mine. Not sure if it’s necessary, but I do. Pecan pie is a hit! I couldn’t wait ’till tomorrow to try it so I had a piece only two hours into cooling..That filling is smooth!!!!! Do I need to refrigerate it over night? I don’t want to ruin the crispy crust, but I don’t want a petrie dish either. Gloria, I think it depends on whatever crust recipe you’re using. I haven’t had to. I’ve got the pie in the oven…Don’t know if you will see this ? in time., but do you think I should cover the pie crust edge half way through the 35 minutes? I’m getting more uncertain about Dorie’s pie, esp. because of the chocolate. She says it adds a nice bittersweet contrast, but I mostly want the pie to taste traditional…hmmm. Julie, I haven’t baked from that book in a while and am not familiar with with the recipe. I’ll look for it. Also, I hate to say this but I’ve always been kind of a traditionalist when it comes to pecan pies. The ones with chocolate never appealed to me, though the idea sounds kind of good right now. Maybe I’ll break down and make Dorie’s pie. Sarah, I’m working on a new pie crust recipe right now. It’s similar to Dawn’s (the apple pie recipe on Disney Food Blog) but with a little less butter in the crust and some other changes. I’ll post it tomorrow if it’s any good. Thanks for this recipe. I made the pie last night to serve at my office’s potluck today, and it received rave reviews. Two people mentioned that it was the best pecan pie they had ever tasted. I’ve been planning to make the pecan pie in Dorie Greenspan’s book for Tgiving. Have you ever tried that one (she incorporates a little chocolate, espresso powder and cinnamon)? I’m thinking of using your recipe, but I like the idea of brown sugar instead of white…would love your thoughts on that controversy:) Also, I don’t think Dorie called for toasted the pecans which I will definitely be doing! Just to be clear, I linked your site onto my FB and it links the picture too. I just want to make sure you know I didn’t post your recipe as mine!!! Thanks! Gloria, no problem! Thanks for sharing it. Thanks Anna for the reply. I posted this recipe on my facebook site. I’ll delete it if not ok with you. Gloria, I’ve been making this one forever so I’m a little more attached to it than Bake Sale Betty’s, but I like both. This one is less brown sugar tasting than Bake Sale Betty’s. It’s also a little less lumpy. In the past I’ve made the pie with salted butter and kept the salt in. Lately I’ve been making it with unsalted butter and using the salt. Either way, it won’t taste salty. Katy, I’m glad I’m not the only pecan pie hopper. Heh. This pie looked so good when I saw it at lunch-time that after work I went out and purchased dark corn syrup ,pie crusts, pecan halves, and eggs!!! There are so many sales! 1. Do you like this one better than Bake Sale Betty’s? 2. Do you add the 1/4 teaspoon salt if you use a stick of regular salted butter? I will try this sometime during the holidays. Looks pretty, too. I am always trying a new pecan pie recipe. I’m never completely satisfied with mine, no matter how many good reviews it gets!! I will have to try this one. It’s one of my favorite pies…sweet potato being very high on the list too!! looks delicious! perfect November food 😉 looks too good for a school function, I hope they appreciate it. My mom loves pecan pies. I’m going to pass this recipe on to her for some extra “good son” points. 🙂 P.S, I love the division tables backdrop on your picture. I never did memorize those things. I hope you post the sweet potato pie even if it’s bad. I know of sweet potato pie, but it’s not a common dessert here in Pennsylvania and it’s not something I’d think to make. If the pies were for morning break, I might think Shoo-Fly Pie. We’ll be here to remind you when you try another Pecan Pie recipe that you said you’d never try another recipe again. ;-). Looks delicious! I’ll make ! Great post, Anna! Got today’s laugh out of it. I actually have never made a pecan pie. Glad to have THE best tried and true recipe right here when I do! What you said about just being really hungry is so true!! Mmmmmmm!!! That looks so wonderful. Definitely sounds great, I bet yours IS better! That’a a beautiful pie! I never met a pecan pie I didn’t love. This looks so yummy – I have never made pecan pie. Would love to do it for the holidays! Somehow I can’t believe you’ll never try another pecan pie recipe…LOL. This one looks beautiful and if I was making one this is the recipe I’d use. You must do a tutorial on how to crimp the edges of the pie crust. This one looks FANTASTIC and I’d love to know how you did it. I try many times to recreate a beautiful edge, but never to any avail. Help!